A conceptual rendering of the FC Cincinnati stadium footprint in West End. "The attached conceptual site diagram is a draft, potential FCC MLS stadium orientation that has been used for planning and discussion purposes with local officials only. 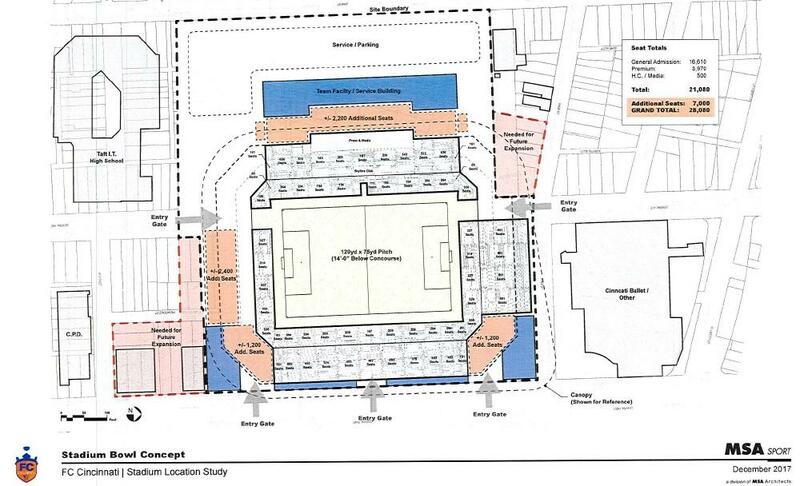 This diagram is part of a fit study to demonstrate how the stadium could orient on the West End site. There are other possible orientations, configurations, seating capacities and other design specifications that will be evaluated in a full design process, beginning with the formal hiring of architects, which would commence if an MLS team is awarded." 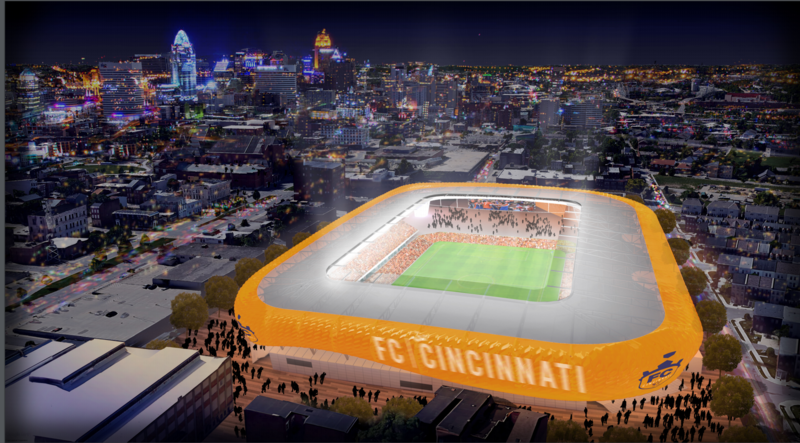 The physical impact of a soccer stadium on the West End is a little more clear, as Cincinnati waits to hear if the facility will come to fruition. Hamilton County Commissioners were updated on the state of FC Cincinnati's plans to build a stadium, Monday morning. The concept shows the stadium taking up the space currently occupied by Stargel Stadium. It would also reach over Central Avenue, and into property abutting Central Parkway. As shown, the stadium would seat about 21,000, but could be expanded for another 7,000 seats. The team would get financing for construction through the Greater Cincinnati Redevelopment Authority. Cincinnati Public Schools agreed to a land swap with the team. Cincinnati Council approved a memorandum of understanding, with the city paying for site preparation and infrastructure. Hamilton County commissioners have pledged support in the form of a 1,000-space parking garage. It would be paid for with the county's parking revenue. The plan has not been without detractors and opponents. Dozens of people spoke at numerous town halls, community council meetings, and public hearings, arguing against a stadium in the neighborhood. The team says the stadium would be necessary if it is accepted into Major League Soccer. The league has not set a date for a decision. 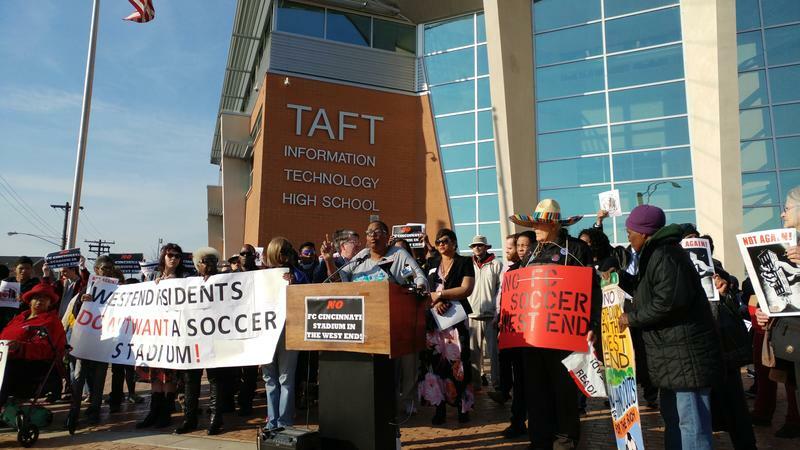 Opponents of a professional soccer stadium in the West End say they're not giving up the fight. Many gathered outside Taft I.T. High School Wednesday night to reiterate their stance, a day after the project took a step closer to reality.